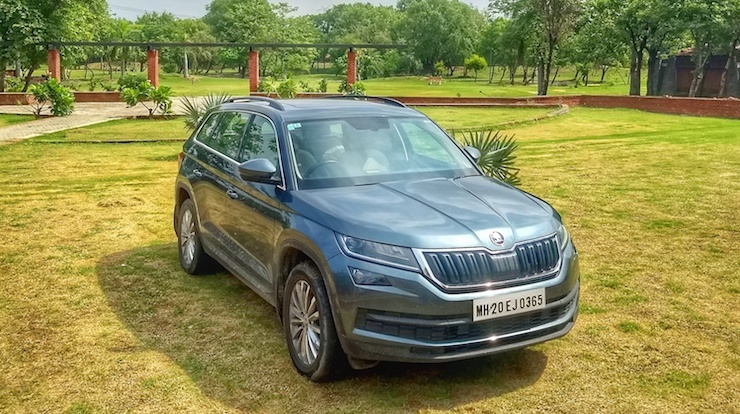 The Skoda Kodiaq is the flagship offering from the Czech carmaker in India and it recently launched the top-spec Laurin and Klement variant in India. Now, Skoda has cut prices of the Style variant of the Kodiaq by Rs 1 lakh. The festive price drop for the Skoda Kodiaq Style means that it now retails at Rs 33.84 lakhs ex-showroom, which is still nearly Rs 87,000 more than the top-spec Toyota Fortuner. Skoda launched the Laurin & Klement variant of the Kodiaq in India only a few days ago. However, until the launch of this new variant, the Kodiaq, which is named after a huge Alaskan bear species was only offered in the Style trim. The Skoda Kodiaq Style comes jam-packed with features that include full LED lighting (headlamps, fog lamps and taillights). Both the headlamps and windshield wipers are automatic units with the former switching on when the light levels go down and the latter swinging into life when it rains. The Kodiaq Style also gets an electronic tailgate that can be opened up by just waving your foot under the sensor on the rear bumper. Inside, the Skoda Kodiaq Style gets dual-tone interiors, 3-zone climate control, electronically adjustable driver and front passenger seats (in 12 different ways) and a panoramic sunroof. The Kodiaq Style also features a large 8-inch touchscreen infotainment system with Android Auto and Apple CarPlay support which is paired with a beautifully tuned Canton audio system with 10 speakers. Both variants of the Kodiaq draw power from the same turbocharged 2.0-litre diesel engine which is only offered along with a 7-speed DSG gearbox. The Kodiaq’s engine produces 148 Bhp between 3,500-4,000 rpm and 340 Nm of peak torque from 1,750 to 3,000 rpm. The 7-speed dual-clutch gearbox sends power to all four wheels via an all-wheel drive. The Skoda SUV also gets electronic diff locks as standard on all variants. However, the Toyota Fortuner offers most of the wow features found on the Kodiaq except for the automation bits. Also the Fortuner’s larger 2.7-litre engine 174 Bhp at 3,400 rpm and 450 Nm of torque at 1,600 rpm. The engine comes mated to either a manual or automatic gearbox both of which are six-speed affairs. The Fortuner gets permanent four-wheel-drive as an option which comes with a proper low ratio gearbox and is also offered with a petrol engine. The Fortuner also offers better ground clearance compared to the Skoda Kodiaq and on the whole gives you more bang for your buck, unless of course, you prefer Skodas.